This review first appeared in the September/October 1990 issue of Living Blues magazine. Antone's Records, pride and joy of Austin club owner Clifford Antone, has been making records for about a half-dozen years now. 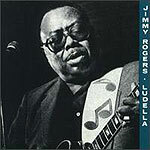 Antone's release of Jimmy Rogers' "Ludella" is only the company's twelfth album. Given that Antone's is something less than prolific (producing about two albums a year), one might reasonably expect the company to invest heavily in the quality of its releases. And one would be quite correct. "Ludella" is, to date, the crown jewel of Antone's Records. The recording production is sterling, with a clarity of sound generally found only on classical music recordings. The liner notes are ample, and the graphical appearance is polished. Best of all, Rogers' performance outshines even Cliff Antone's flattering packaging. An early member of Muddy Waters' band, Rogers has long been an important, if not well-known, contributor to contemporary blues. On "Ludella," he shows that age has not diminished his skills. And the material (all but two songs are written by Rogers) is as strong as the performance. The album kicks into gear right from the get-go, with a rousing performance of "You're Sweet." The gently swinging rhythm undulates behind Rogers' slightly hoarse vocals in this traditionally styled blues. An extra treat is Rogers giving pianist Pinetop Perkins (a fellow Waters alumnus) a lengthy solo. Some of the songs were recorded during live performances at Antone's, and these feature Hubert Sumlin sitting in on second guitar. One note of confusion: David Whiteis' liner notes list Calvin "Fuzz" Jones and Willie "Big Eyes" Smith as playing on the album, while the credits do not. But listening to "Chicago Bound," "Why Did You Do It?" or a cover of Willie Dixon's "Got My Mojo Working" is remedy enough for the confusion. "Ludella" is sure to vie for best traditional album at next year's Handy Awards, and offers evidence that Antone's is ready to move into the circle of top independent labels.